Summer Review Roundup | Barry N. Wasserman, M.D. As the saying goes, all good things must come to an end. Sure, the weather will soon get cooler and the days shorter, but we still have plenty to smile about here at Dr. Wasserman’s! Over the past few months, patients young and old, near and far shared their experience at Dr. Wasserman’s with us and, to be honest, we couldn’t be more honored! Below are just a few of the reviews we got this summer, from patients who just had their LASIK procedure to some that are still seeing clearly more than a decade later! “I should have done this decades ago! An easy pleasure experience with a comforting staff. Looking for a doctor that knows his craft, call Dr. Wasserman.” – Sherri A. “After 35+ years of contacts and 40 years of glasses, I finally did it! I have been apprehensive about LASIK for years and I could not take being unable to see any longer. I wouldn’t trust anyone else with my eyes….Dr. Barry Wasserman was completely correct when he told me this was going to be an easy procedure. He talked me through the whole thing and I was completely blown away when the procedure was exactly how he said quick, painless and the results were immediate! I sat up from the LASIK and could actually see the clock on the wall! There wasn’t downtime, except for the 4-hour nap I took after I got home. 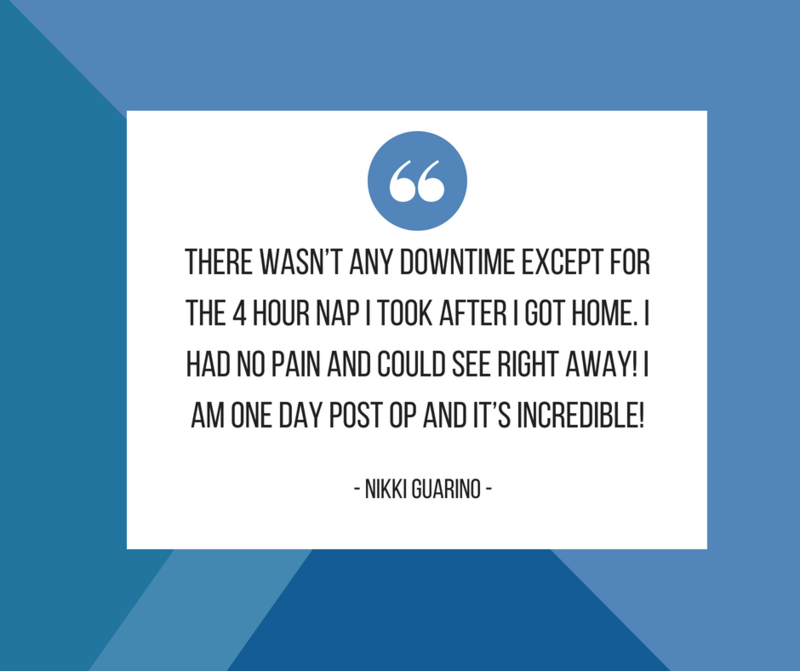 I had no pain and could see right away!” – Nikki G.
“Dr. Wasserman is the best. It’s been almost 13 years since I had LASIK. Two kids later, I’m extra glad I did. No glasses for those midnight feedings made life easier.” – Jennifer A. “I have worn glasses since I was 6 years old. I was so nervous to have the procedure done, but I knew I was in the best hands. I will never forget waking up from my 4 hour nap and being able to see without glasses or contacts for the first time in 18 years. Three years later, my eyesight is still perfect. Thank you, Dr. Wasserman, for giving me the ability to see clearly!” – Courtney L.
“3 1/2 months out, it’s the best decision I ever made. I wish I would have done it sooner!” – Allison M.
“I’d had Lasik with Dr. Wasserman and it could not have gone more smoothly. He was kind and professional and experienced. 10/10 would recommend!” – Kim S.
“My 2-year-old son Mason needed a corrective surgery of the muscle on his left eye. Prior to taking him to see Dr. Wasserman, I took him to another hospital in the city where multiple residents spent nearly 9 months trying things that didn’t work. I was very much afraid of complications and trusting anyone with operating on my son’s eyes. My first appointment at Will’s Eye, Barry introduced himself and explained every detail and risk involved. The surgery went down exactly how he said it would, just as the recovery and expected outcome. I don’t typically write recommendations online, but he deserves it 100%.” – Marr D.
“[It’s been] 4 years now and I still have perfect sight!” – Jennifer Y. “Dr. Wasserman did my LASIK ten years ago, and I still wake up every morning thrilled with the decision. Couldn’t be happier!” – Linda L.